Faithful Fish Pattern Die, Ovals and Stitched Ovals. To see all the projects created for this challenge or to join in the fun click here. You have until August 30, 2015 at 8:00pm EDT to join us. By participating in the challenge, you have a chance to win a $15 ODBD Gift Certificate good towards the purchase of stamps in the “stamps column” on the ODBD website, or to be spotlighted on the ODBD Blog at our next challenge. The random prize winner will be posted on our next challenge post. Please do not post on Flicker as many of us do not have the ability to comment on your cards nor can we spotlight your cards on the blog. What a gorgeous card Diana!! I love the regal blue, black and kraft with the pops of white!! It is very striking!! Your use of the banners is a beautiful touch! The doily gives it texture as does the fish embossed background! Beautiful my friend! Hello my friend! I love your creation using the fish background!! 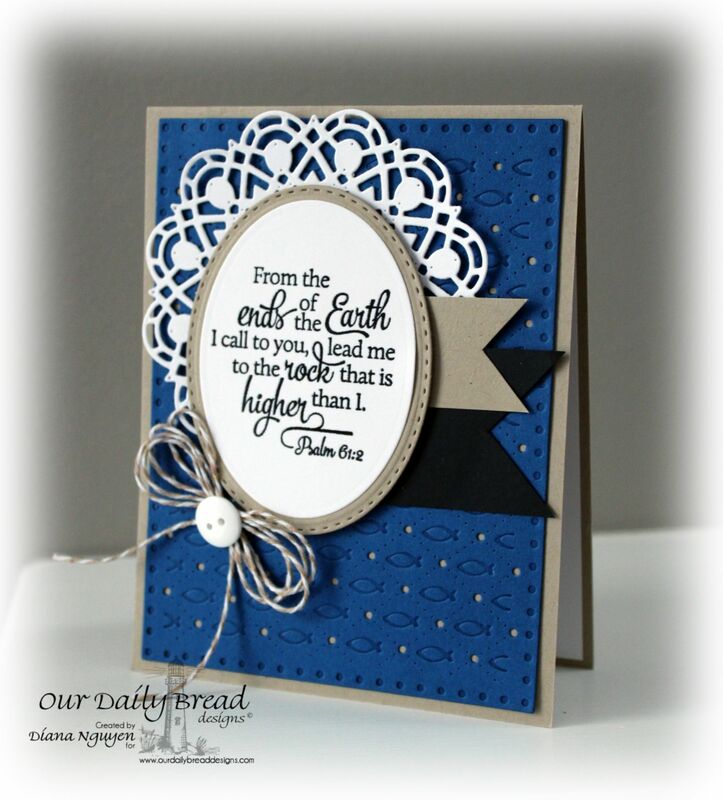 It gives a beautiful embossed texture to your design and using just part of the doily is brilliant! It looks so pretty! Love your twine and button too, so sweet! This is really sharp looking Diana!! Love the doily peeking out and the twine bow!!! The embossing adds another nice layer of texture too!!! Just beautifully done sweet DT sister! How very striking, Diana, and I love the Scripture you chose! Your style is always so elegant! Hugs! Hi Diana! What a gorgeous card, as always. You are SO talented my friend. I really would LOVE to have you stop by and share your art with us at Word Art Wednesday. We SO enjoy your fellowship, and hope to have you join us. There's also a HUGE celebration on our blog September 9 with TONS of awesome prizes as we celebrate our 200th challenge. I hope to see you there, my friend. Diana, such a classic, cool look! Lovely card!